Here is a picture of Caleb riding to Meriter Hospital in the ambulance. If you look closely you can see the ice packs in the back of his head. At baseball last night his feet slipped out from under him on wet concrete. He fell backwards hitting his head and back with full force. I was lucky to watch in complete horror. I expected blood everywhere. He rang his bell pretty good. I held him for a bit until he calmed down, checked for broken bones, bleeding, and made sure he could talk and move his fingers and toes. Then we got all the other kids loaded up and headed to urgent care to get him checked out for any internal trauma. 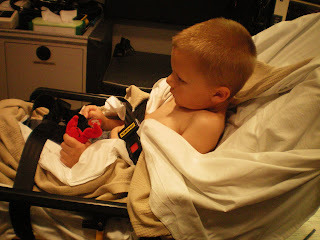 We were on route to the hospital when he began to cry about the pain in his head (no kidding!) and then his eyelids got pink and droopy. A few minutes later there was lots of vomit. We were on hold with urgent care since loading the kids in the van, but once he vomited we hung up and dialed 911. 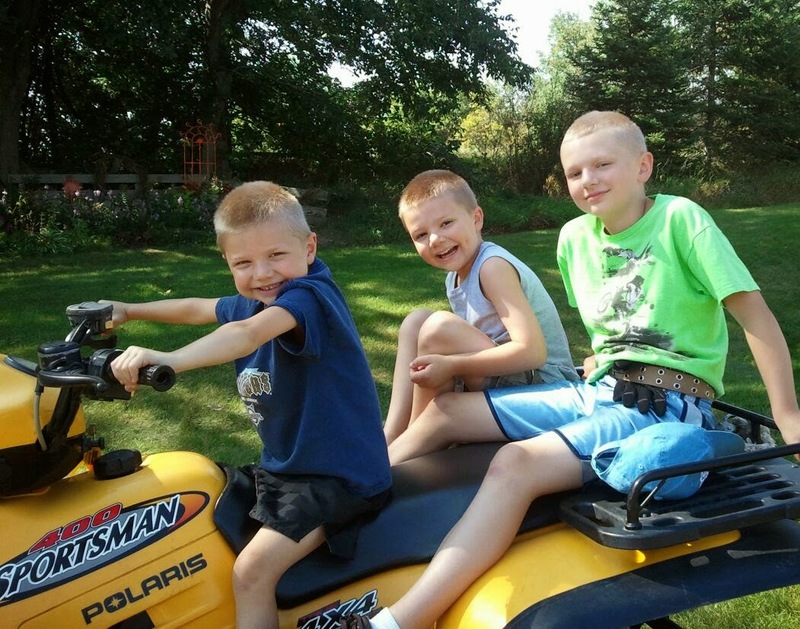 We knew at minimum he had a concussion, but became alarmed once he had 3 head trauma symptoms. We met an ambulance about 8 miles outside of Evansville where Caleb was then transported to the ER for a CT scan. John drove the van with David and Nathan and I rode in the ambulance with Caleb. It was very hard to keep him awake. He was so brave thru the whole thing. The CT scan was a scary ordeal for him but he only asked to hold my hand thru it all. The technicians allowed me to come in with a lead vest and I was able to be near him holding his hand thru the CT Scan. His eyes got VERY wide when the red lasers moved over his face. I had to reassure him that the lasers where not the ones used on a gun. We got the CT results around 11:30 PM. No internal bleeding or skull fractures. We were then allowed to give him medicine and let him fall asleep. It was a scary ordeal for him and me! We got home around 12:30 AM and I was instructed to awaken him every 2 hours to check on him. No easy task. He is ok. He has a headache and a bump on the head but is acting normally today. Pretty scary, but considering what could have been, we are blessed to have just a concussion.